Worldwide, millions of people suffering from one of the most common skin disorders called Psoriasis which has a huge impact on the patients’ daily lives. However today, most advanced technologies in medical sector have been made to treat most difficult cases of psoriasis in safe, convenient and effective manner. Yes, UV Comb is the most effectual and proven method of psoriasis treatment. Let’s know about it in detail! What is Psoriasis and how to get rid out of it? Psoriasis is a long-term immune-mediated inflammatory skin disease that is characterized by an itchy or painful red rash covered by flaky silvery scales, commonly on the knees, elbows, lower back, palm of the hands, soles of the feet, scalp, trunk and buttocks. Psoriasis can range from mild to severe and it can also affect the fingernails and toenails, the genital area, the joints and the inside of the mouth. Psoriasis is not contagious and does not spread by touch from person to person. It affects both male and females equally and usually develops in adulthood, although it can affect younger people. 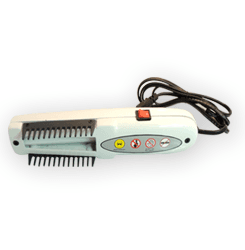 If you’re suffering from Psoriasis, you can come out of it by start using UV Comb. Why you should go with UV Comb for psoriasis treatment? If you’re experiencing Psoriasis, then it’s your time to know below listed top 8 reasons that tells why you should go with UV Comb. 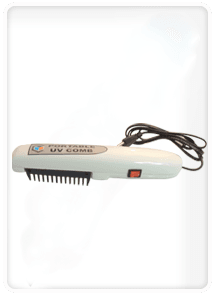 Yes, UV Comb is specially designed to bring your psoriasis under control, clear your lesions, and improve your quality of life in the shortest period of time. Ultraviolet (UV) light is getting more popular as an effective treatment for extensive psoriasis and some other inflammatory skin conditions. The UV light penetrates the skin and slows the growth of skin cells that cause the skin lesions. So, start using UV Comb for psoriasis treatment right away!